I can't decide if blueberry or pomegranate is my fave. You crushed my heart. Is the rumor true? No more Luna Moons? I don't think I was the only one who loved them. I know I wasn't the only coach who shared her love with her athletes. As a newly minted member of Team Luna Chix, I thought I might be lucky enough to enjoy a year eating and promoting all the Moons my stomach could handle for the love of Luna. But alas, you sent me this news that made my heart sink. "We’re sad to let you know that we’re discontinuing production of LUNA Moons. We love LUNA Moons and know that there are many women out there who love them, too." What? No Luna Moons? Well isn't that a knife stuck straight through my stomach. 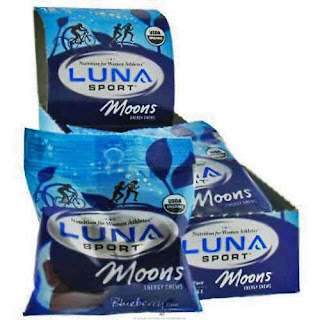 With the exception of the watermelon flavor (something about fake watermelon has never sat well with my taste buds), I gobbled moons at the race expos when Luna was sampling, snatched up packets when REI put them on sale and packed at least two pouches among my race day goods as my go-to before bonking. But now what am I supposed to do? You just took away my female friendly fruit snacks that psychologically made me feel like I was racing stronger, harder and faster than the grocery store substitutes. And in a format far handier--and friendlier on my tummy--than a Shot Blok. Yes, Shot Bloks are too big of a jolt for my stomach, so are gels, and I needed something I could pop like candy, like the jelly beans I didn't leave home without. Luna, I'm confused. If you know that you love the moons and that other women love them too, why are you discontinuing them? I heard about the launch of Luna Protein but you can't say that's a substitute, not for me anyway. And I can't go cutting Shot Bloks into more manageable pieces before a race. Can you imagine how sticky that would be? And how would I get the sharp knife through security? I don't think the plastic variety would saw through those Bloks with any sort of ease. I understand the need for change. Really, I do. But before those moons disappear from the shelves I can guarantee that I'll be buying bunches in bulk when I spot them. I need a Moon stash--even if that means eating them months from now when I'll be sucking instead of chewing. Isn't there a petition we can sign to save the Moons? Don't make them disappear from the shelves.